Moments after his Kennard-Dale team had just completed a second-half comeback and after the TV cameras were out of his face, head coach Kelly Wetzel had a brief second to let what had just happened sink in. “Finally,” he said with a sigh of relief and a smile. That word summed up not only the feeling of his program, which had reached the district semifinals four of the last seven years and advanced just once, it was also the feeling of every other girls’ lacrosse team in the district that had seen Manheim Township win 30 straight district playoff games and seven-straight titles. But Kennard-Dale ended all that. 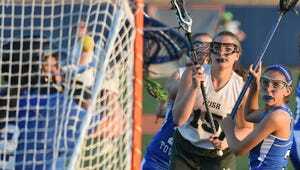 With a late push, the Rams erased a four-goal deficit and knocked out the only team that had ever won a District 3 title, 17-15, at Hershey High School. The Rams knew all about the Blue Streaks’ storied history. This is the same Manheim team that has knocked Kennard-Dale out in the semifinals two straight years and up until the last 10 minutes or so, it looked like it would happen a third time. The biggest difference was the Streaks won 12 of the first 16 draw controls, then the Rams flipped the script late in the game. Dressel scored five times, including two that capped off a 6-0 lead in the game, and added four assists for the Rams. Gillian Zimmerman added four goals and Morgan Bowings scored three times while sophomore Clare Boone made six saves in net. The win booked a trip to the district title game against Exeter Township on Thursday at Hershey Park Stadium and a trip to states for the third time in program history.